The more wood furniture I see around blogland that has gotten a paint make-over the more I like painted wood. Most of my extended family and a lot of my friends practically break out in hives when I mention the words ‘wood’ and ‘paint’ in the same sentence 😀 But I LIKE painted wood! It brings out the details of the construction of the piece in such a wonderful way – a way you just don’t see when distracted by things like wood grain and stain! I also love white more all the time. My home is slowly, slowly starting to feel ‘white’. It’s getting there! I have a few more things to paint and now I have a new couch and chair to slip cover. I want to use drop cloths but this time I think I’m going to try bleaching the fabric first to turn it a bit more white. 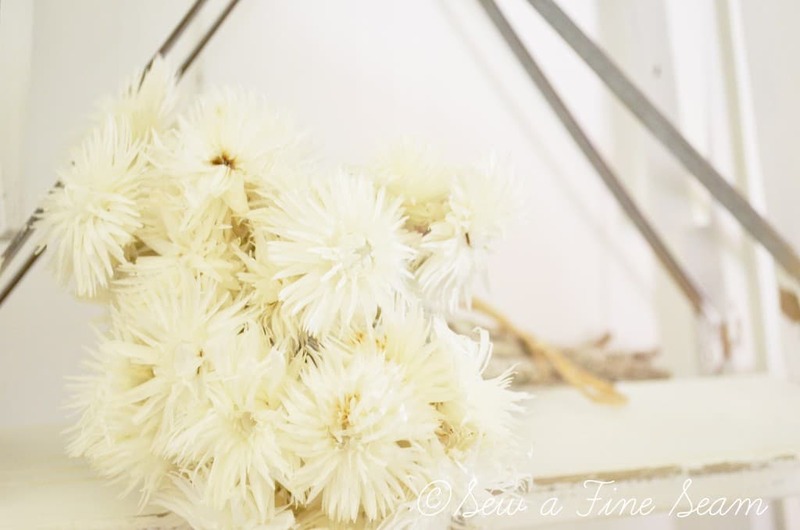 I loved how these chairs turned out – if you missed them you really need to check them out. Pure white duck cloth = pure loveliness. I would buy duck cloth except that I’m slip covering a rather long couch and a sort of large chair and drop cloths are cheaper. If the bleaching works out I’ll probably bleach the slip cover from the couch that is already covered. I recently painted a couple of things – one warmer Saturday. Spring is having a struggle getting itself firmly established in Ohio but we have had a few warmer days. It felt so good to wield a paint brush and dip into the Annie Sloan paint again. I still haven’t taken pics of the box, but I did take pics of this wonderful wood ladder that I painted the same day. I found it at a local ReStore several months ago for $9.99. I debated whether I should drag it home but I’m really glad I did. It hung out on my porch most of the winter but now it graces a corner of my living room. It looks quite at home leaning against an old door, which also got a quick coat of paint. The antique grain sack and dried flowers go well with it I think, along with my dress form. The red of the little wood piece was cute and I really do like red. But somehow it was just too bright or something so I painted over the red with Duck Egg. The ladder, old door, and dress form fill the empty space left when I gave the cupboard that was there to a cousin as a wedding gift. It is fun to have something there again that looks cute. I like it even if a lot of other people don’t ‘get it’. 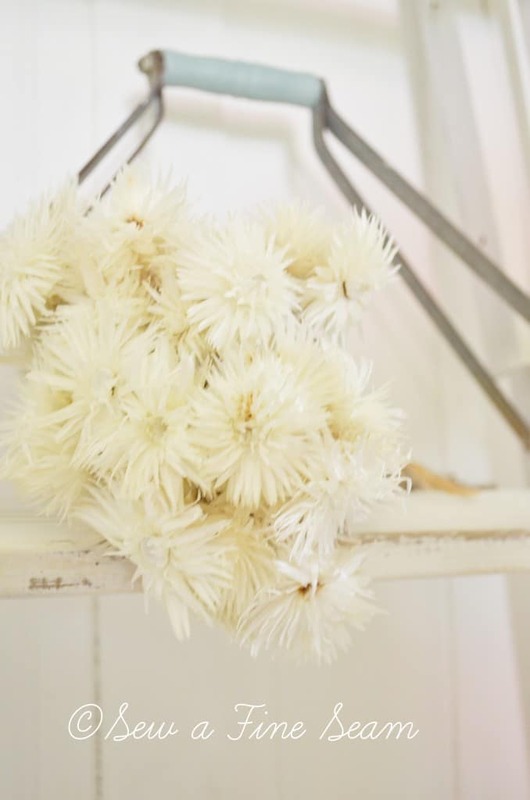 It’s old, it’s wood, it’s painted white, it’s a bit quirky, what’s not to love?! 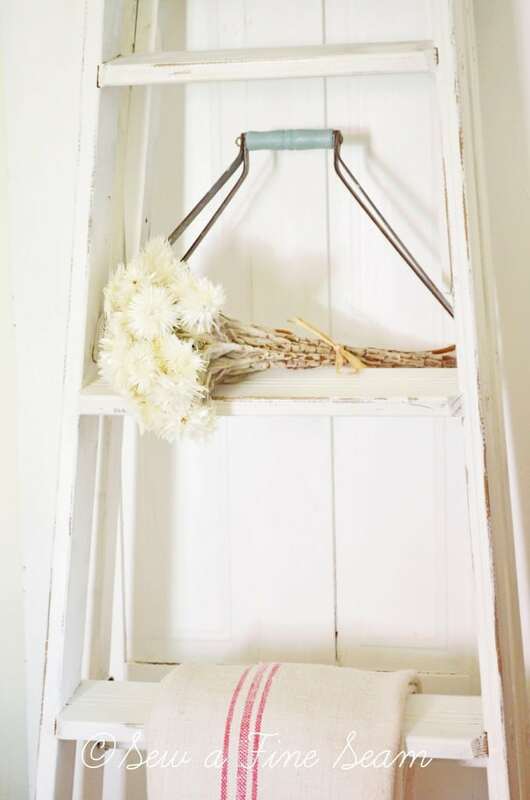 Would you use an old ladder in your home decor? Your ladder is so lovely painted white! You are going to have fun changing out displays on that piece! It makes a lovely backdrop for photos too! Love it all – looks very fresh! Years ago we made fun a friend that picked up an old ladder in a pile of junk, as soon as we saw it in her living room we had a new appreciation! Yours is lovely! Ohhh, I LOVE the lovely gold of your “new” couch… just slipcover it! Bleaching is so…final! That corner is adorable! What a beautiful piece that you worked your magic on! That will be such a great corner for photographs, too! Have a great day, Jill. LOL! I know Breida, I know! It was criminal wasn’t it?! But I knew I wouldn’t want it red and it would just bug me to no end if I left it red! Actually what I really didn’t like was that white spot on it and it wouldn’t come off. it wasn’t till I had the red all painted that I realized that little handle would move and I could have just put the white spot to the back! Sigh! Thanks Diana, I am rather in love with it! It’s fun to paint something that you end up loving more than you thought you would! That does it. I’m painting a huge ladder my friend got for me out of someone’s trash. I can never decide but you make me see the light (or rather the “white”!) That metal with the wood handle on there is so cool. I’ve never seen one like that before. You done good! Oh, yes, white on the ladder is great! Gives me ideas about the old wooden ladder in my garage that we’ve had for 25 years. Love this! So sweet in white for sure. And I hear you about the reluctant Spring. Same here in Missouri. I love the ladder! It looks great and makes neat little shelves. The duck egg handle is pretty. I really want to try Annie Sloan on my basement cupboards. The fun thing about paint is you can always repaint when you want to change it. Did you buy the gold couch from Grandma’s basement? 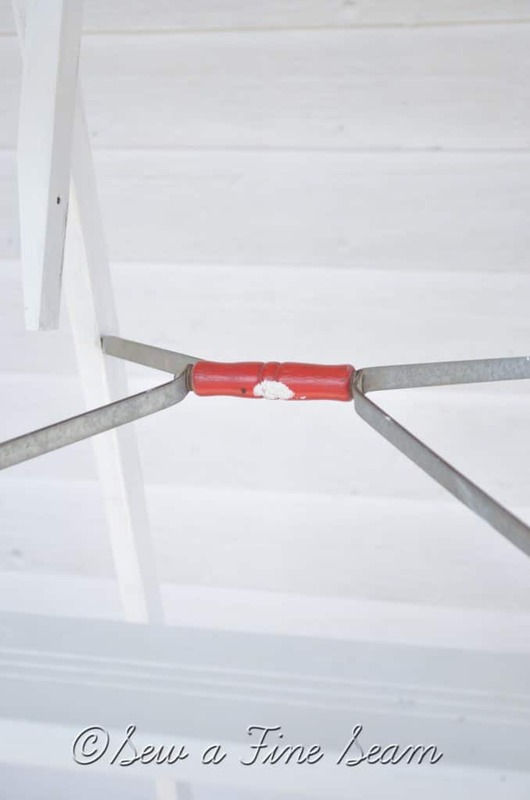 I have an old ladder you are welcome to! LOVE LOVE LOVE your ladder! You are so talented and as usual, your project is awesome! Yes, I would definitely use a ladder! Love your transformation…turned out beautifully! Thanks Cindy! I like it a lot! I will never walk by a ladder again without thinking of the decorating potential it could have. Simply lovely. I also adore the new pictures on the blog. It’s ironic that your house is becoming more white and your blog is infusing more color (like your updated profile picture). I love it! I just love your ladder. so glad you took it home. It looks great in that corner and you can change it in so many ways. A painted ladder is a must in or out of my house. Painted wood? Yes and no – I have both. I am currently trying to make a decision whether or not to paint my grandparents’ first bedroom suite from the 1920’s. It will be a battle in the family, for sure! I love the ladder in white! We were just talking about ladders. I found two today at a garage sale! Maybe I will go with white, your sis so pretty! I normally also wince at the term “painted wood” but this is a great makeover! I also really love painted wood floors, in a number of variations, but I could NEVER do it myself ha! I love it! My daughter asked us just the other day to keep an eye out for an old wood ladder that she wanted one. One that is old, wood, painted white and a bit quirky would be perfect! Oh I love this!!! Yes, I love using old ladders – I used on as a Christmas tree, another as a bird bath! I love the idea of painting one – so much fun! Pinning this beauty (and hoping my family doesn’t break out in hives)! So fun Kelly, I think I saw your ladder Christmas tree – great idea! Hi Jill, I love your ladder and I’m so envious of your dress form. I’ve been wanting one for awhile now. I have the same problem with my husband on painting wood but he’s finally getting resigned to it. lol I’m so glad you linked up this week at Transformed Tuesday. Thank you Peggy! Always fun to link up with you – and always such a thrill when you feature my stuff!! Thanks! I’m always on the lookout for a ladder to paint pretty! Love this so much friend! I am so in love with my ladder! Can’t believe I waited so long to paint an old ladder!! I have another one for another project – hoping I soon have time for it! If you haven’t entered my giveaway come back and enter! 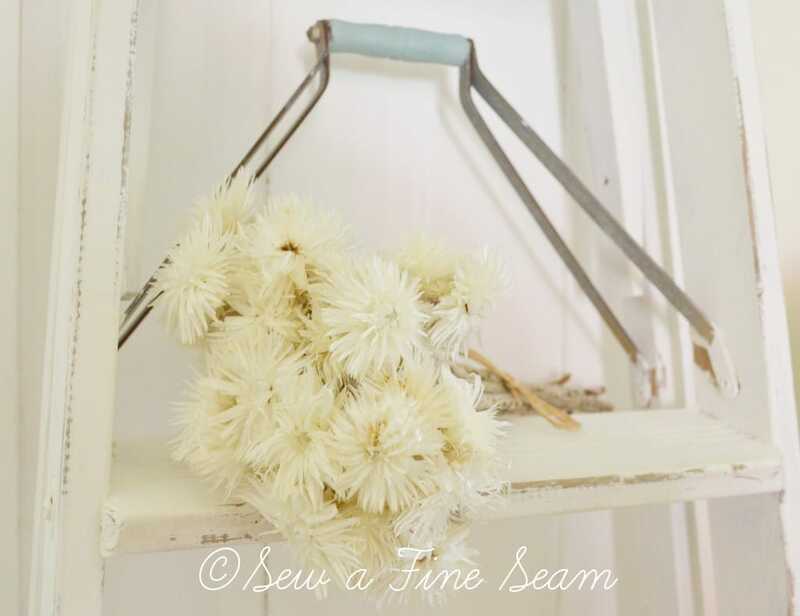 Now I luv your old ladder…I just sold one in my shop that I had painted white. Thanks for sharing at my party this week. I’m in Italy and I found an old olive picking ladder on the street. 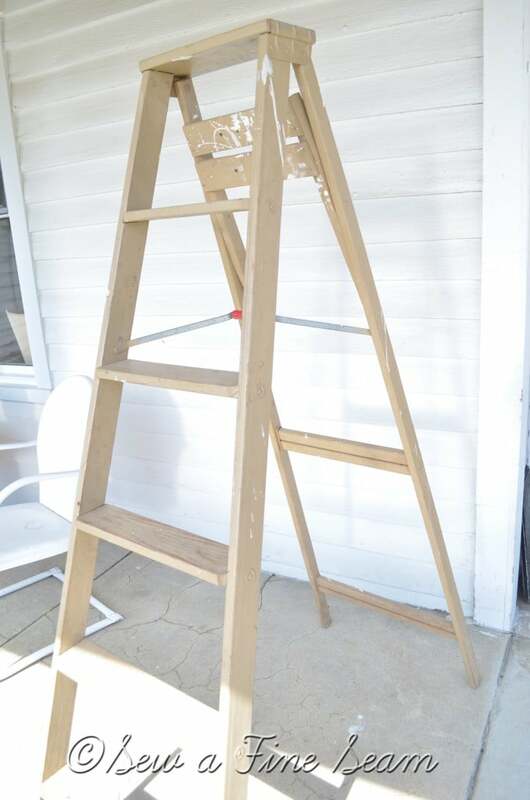 Your project makes me want to paint my ladder white. It would probably be some kind of crime against society here too. I love how a ladder is a symbol of reaching for the sky. I am one of those who is painting all my wood pieces and loving the softer look. I love everything you painted. 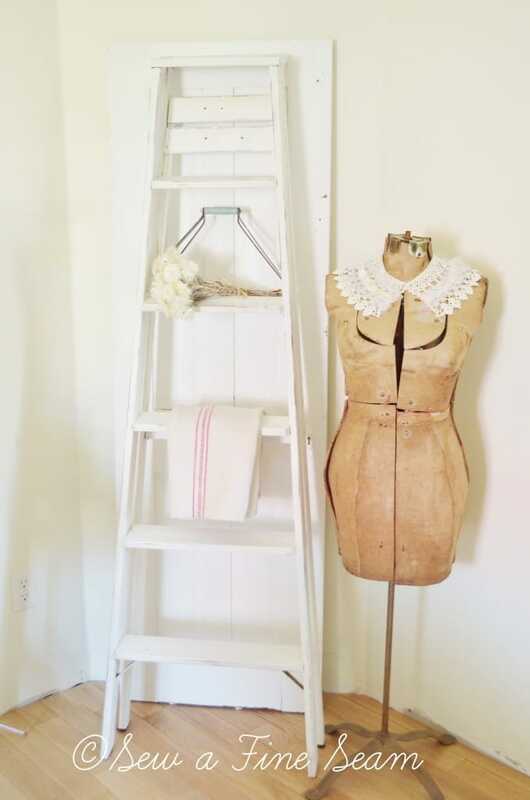 I wish so much that I had a space for a ladder because I just love the look. Love your ladder! Had to come back to thank you for sharing at AMAZE ME MONDAY!! !